Two 3-run late-inning comebacks rally Ft. Scott to sweep of KCKCC – Welcome to Wyandotte Daily! Facing the No. 1 offensive team in the Jayhawk Conference is no time for defense and pitching to implode, which is what happened to Kansas City Kansas Community College at Fort Scott Saturday. Twice the Greyhounds came from behind with late inning 3-run rallies, winning the opener 7-6 in the bottom of the seventh and taking the lead in the eighth inning in an error-marred 15-13 second game win. 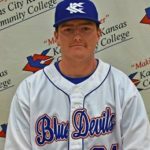 The losses dropped the fourth place Blue Devils to 13-11 and set up a critical four-game series this week with Neosho County (12-12), one of KCKCC’s closest pursuers along with Coffeyville in the race for an all-important first division finish and a home playoff berth. After a home non-conference doubleheader with Baker University junior varsity Tuesday at 1 p.m., the Blue Devils entertain Neosho Thursday at 1 p.m. before finishing at Chanute on Saturday. Fort Scott’s sweep kept the Greyhounds (19-5) two games back of Cowley College (21-3) in the Jayhawk with Johnson County (15-9) two games in front of KCKCC in third. The Blue Devils made the most of just four hits in the opener, building a 6-4 lead heading into the bottom of the seventh only to have the Greyhounds score three times. After an inning opening walk, Julian Rivera came on in relief of starter Carlos Soto. Rivera struck out the first man he faced but then issued a walk, a run-scoring single to Collin Fraley and a two-run single to right by Owen Wilson that won it. Rorey Combs and Gavin Gifford had the big blows for KCKCC. After two walks and a hit batsman loaded the bases in the third, Kevin Santiago’s fly ball scored one run and Combs doubled in two for a 4-0 lead and Gifford made it 5-0 with a leadoff homer in the fourth before Fort Scott started its comeback. Andrew Morrow belted a two-run home run in the fourth and Ben Kiefer had a solo shot in the fifth for the Greyhounds, who lead the conference in home runs, batting average and slugging percentage. Soto allowed six hits in 6.0 innings, striking out three and walking five. Gifford homered twice and Jared Goodfellow once and each drove in five runs but it wasn’t enough to overcome seven Blue Devil errors and 12 unearned runs in the 15-13 nightcap. Gifford’s third home run of the day following a double by Combs and a hit batsman gave KCKCC a 13-12 lead in the eighth inning only to have the Greyhounds score three unearned runs in the bottom of the inning for the win. A walk, single and a pair of two-out errors gave Fort Scott the lead 14-13 and McConnell added a run-scoring double off Gunner Vestal, the Blue Devils third pitcher. KCKCC jumped off to a 6-0 lead only to have Fort Scott score nine runs in the fourth inning off starter Bret Snider. All were unearned. After two errors and a hit batsman ignited the inning, the Greyhounds got a bases-loaded double from Wilson and a two-run homer by Quinn Waterbury. However, the Blue Devils came right back to tie it in the fifth on a Brigham Mooney single, walk and Goodfellow’s three-run home run and then went ahead in the sixth 10-9 on Goodfellow’s walk with the bases-loaded. Fort Scott regained the lead 12-10 in the sixth, scoring three times off reliever Allan Brown on two hits, two walks and a pair of errors. KCKCC took a 1-0 lead in the first on singles by Tyler Pittman and Brandon Still, added two in the second on a walk, Gifford single and Goodfellow double and made it 6-0 in the third in a 3-run uprising capped by Gifford’s first home run of the game.